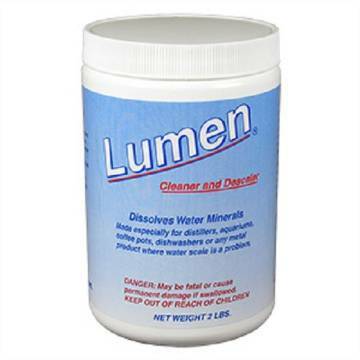 Lumen is a cleaner and de-scaler for removing mineral deposits in the boiling tank of your distiller. It can also be used for coffee pots, aquariums, dishwashers or any metal product that has scale buildup. The manufacturer recommends cleaning the boiling tank of your Steam Pure or Mini Classic Distiller once a month or every 30 gallons.